With all of today's technology for Wi-Fi RV access it's easier than ever to stay in touch. Even though as full-timers we have wanderlust in our blood we still need to stay connected to friends, family and finances. We've outlined a few of the most common RV satellite system, and Dish RV satellite system choices below. 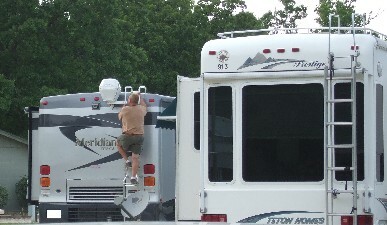 Wireless Internet or Wi-Fi RV access is usually available in most modern RV Parks. It is usually free although some charge a small connection fee charging either by the day, week, or month. No special equipment is necessary as long as your computer has a modem. These connections are usually not super-fast. Although, we have been in a few parks that offer free Hughes Net Wi-Fi RV access which we loved. If you have a weak signal in an RV Park there is a lot of information online about Wi-Fi RV access repeaters that can be helpful if you're trying to boost your signal. Another option if you need an internet connection while on the road is the wireless internet 3G networks offered by companies like Verizon. The equipment isn't expensive; generally less than $100 and you will have internet access nearly everywhere. There is a monthly service fee which is currently running around $70 a month. This will give you broadband speeds and a relatively inexpensive price. Mobil satellite TV dishes are also available in either a mobile or stationary model. One example is the Data Storm Satellite. 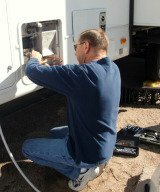 These dishes can cost over $5000 for the equipment and $100's a month for the service. These dishes are for large data or live video like they use for network television stations. If you're just going to check your bank account or email the kids you probably won't need to get this fancy. Cell phones are so common today and essential for the full-time RVer. You can even get a cell phone with internet access from most companies. We use our cells as our primary phone numbers. Another cool option is the Magic Jack. You may have seen the infomercial on this cool little device. It will let you call long distance and even over seas for only $20 a year! You simply plug it into your computer, connect it to a regular phone and dial like you ordinarily would. You do need to have a high-speed internet connection, but we've tried this product and it works really well if your connection is good. When we travel on business for Don's job we take the Magic Jack and can use it in the hotel rooms. It's great for not burning up cell phone minutes. It may be cheaper if you order it from QVC. To check it out go to magicJack. Camping World sells a Mobile Satellite TV Antenna called the VuQube 1000 Portable Satellite TV Antenna . They currently have three different models available. This handy device will sit almost anywhere you get a clear line of sight to the southern sky. Then use the wireless remote and built-in automatic level compensation to position the antenna and acquire the satellite signal in less than five minutes. It can store two satellite positions in memory for quick, one touch recall. The great thing is you won't waste time looking for a signal. It will work with DIRECTV, DISH Network, and Bell ExpressVu. These cubes are currently running from $699 to $1500 depending on if you want the mobile or stationary model. (Satellite-To-Go) which combines a 17-inch LCD TV, DIRECTV Receiver and DIRECTV antenna all in one compact unit. You can enjoy 100% digital TV anywhere you have a clear view of the southern sky. It's about $1000. You can get a free satellite dish from most service providers when you sign-up for their service. We got our free dish from DIRECTV. When we first started moving from park to park it was a challenge to find the signal and set-up the dish. We worked out an easy storage and set-up system that has our dish up and running in about 10 minutes. Here's instructions how we made our Satellite Dish Mount on our ladder.